Sheffield City Region’s excellence in advanced manufacturing and engineering was showcased to the world today, November 14th with the official opening of McLaren Automotive’s new Composites Technology Centre. It was officially opened today by the Duke and Duchess of Cambridge, and the Crown Prince of Bahrain, at an event attended by high-profile figures from across Sheffield City Region and the North. Some of McLaren’s latest sports cars and supercars were also in Tudor Square in Sheffield city centre today thanks to local retailer McLaren Leeds allowing members of the public – including a group of UTC Sheffield engineering students – the opportunity to see the vehicles up close, while also learning more about the facility opening just a few miles away. Dan Jarvis, Mayor of the Sheffield City Region, said: “We know that our region is world-leading in advanced manufacturing and engineering. Investments from companies such as Siemens, Rolls Royce and Boeing are testament to our growing international reputation for excellence. “So it’s great to see McLaren Automotive also opening here, demonstrating further confidence in our strong manufacturing heritage, confidence in our workforce’s ability to deliver, and confidence in the cutting-edge collaborations between university and business that enable us to lead the world. Mike Flewitt, Chief Executive Officer at McLaren Automotive, praised the Sheffield City Region’s expertise in advanced manufacturing, saying: “It was an honour for myself and all of the 2,300 people at McLaren Automotive to host The Duke and Duchess of Cambridge and His Royal Highness Prince Salman Bin Hamad Al Khalifa, the Crown Prince of The Kingdom of Bahrain, to officially open the MCTC and to show them the process we are innovating for the production of carbon fibre. They met some of the extraordinary, creative and passionate people we already have working here who are making that ambition a reality. “It is an important milestone for us as a ground-breaking, innovative car company and allows us to tap into the great energy, vitality and skills this part of the world has to offer. What goes on here at the MCTC will be vital for our ability to make good on our intention to continue to develop and unveil cars that are lightest in class; it is my belief that Britain – through facilities like this – can become a world leader in lightweight materials technology that will help create more efficient future vehicles. President and Vice-Chancellor of the University of Sheffield, Professor Koen Lamberts said: “This new centre is a cause for celebration for our region, the North of England and the UK as a whole. “We are proud that McLaren was attracted to our region by the University of Sheffield’s Advanced Manufacturing Research Centre (AMRC)’s world-leading research, our investments in facilities and our established partnerships with industry. Just yards away from McLaren’s new centre we also have the AMRC Training Centre, which is training McLaren’s first degree apprentices in the Sheffield City Region. Keith Ridgway, Executive Dean of the University of Sheffield’s AMRC, said: “It’s great to see McLaren Automotive bringing the production of their supercar bodies to Britain; and even better that they chose to do it here in the Sheffield City Region. The AMRC’s expertise in composites and lightweighting was a critical factor in this great British car maker’s decision to locate their own state-of-the-art factory here in Rotherham. 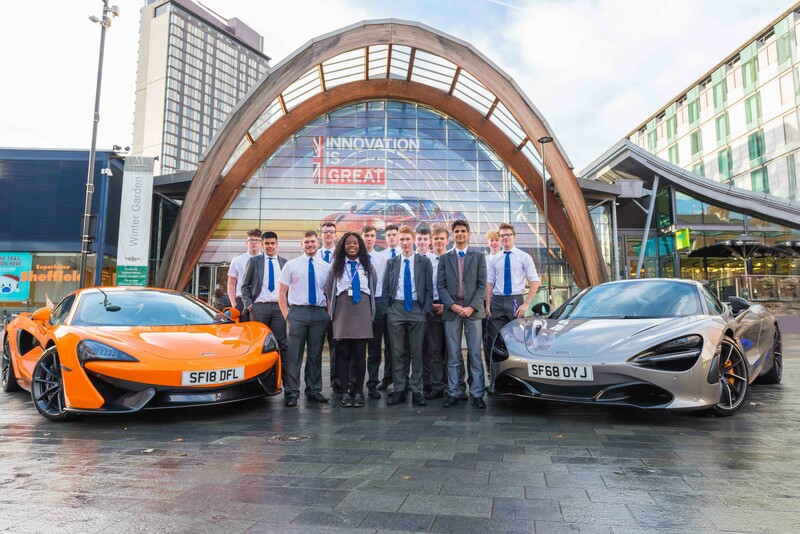 Julie Dore, Leader of Sheffield City Council, said: “The McLaren brand is renowned for innovation, performance and for being at the cutting edge of technology. It is entirely fitting that they have chosen to base the new Composites Technology Centre at the heart of the UK’s Advanced Manufacturing Innovation District.